A few days ago Outlander Addiction’s Facebook page reached a milestone – 5,000 likes! That is a tremendous achievement considering we’ve only been in existence less than 6 months. As a special ‘thank you’, we are holding another giveaway! 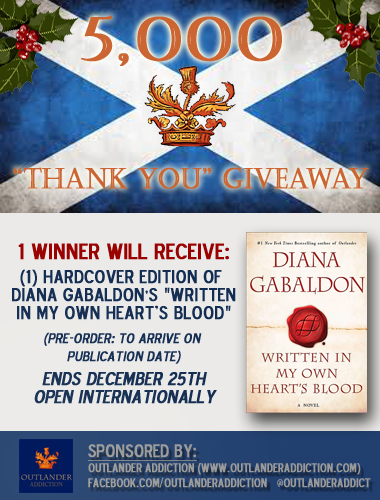 One winner will receive a hardcover copy of “Written In My Own Heart’s Blood” by Diana Gabaldon. Please NOTE: You will receive your book on the publication date, June 10th 2014 for U.S. winners (TBA for international winners). This giveaway ends on Christmas, Wednesday, December 25th at 11:59pmPT. Open to US and international fans. Void where prohibited. Must be over 18 to enter. I can’t wait to read the newest installment! Congrats on the milestone, I’m sure it won’t be the last! Winning the book from here would just be fuel for the Addiction!!! My favorite series of all time. OMG…I want this SOOO BAD!!! THANKS SO MUCH FOR TAKING CARE OF ALL OF US CRAZY OUTLANDER FANS!!! i can’t wait to read this BOOK!!! what a fantastic gift this would be!! How fun! Sooo looking forward to the book and series! Congrats! Thanks for the giveaway! I’ve already pre-ordered the Kindle version, but would LOVE a hard copy too! I love following you guys as part of my Outlander obsession!! Thanks for this awesome opportunity! Awesome giveaway! Good luck everyone!!! Thanks Outlander Addiction for giving us this chance and congratulations on reaching 5000 likes!!!! Thank you for the giveaway. I am anxiously awaiting publication of this book! Merry Christmas everyone and Good Luck to all! what a great giveaway! love the site! This would be a fantastic prize to win! Here’s my comment. Here’s to winning; cheers. What an awesome Christmas giveaway! Thanks for doing this! So can’t wait for MOBY! Congrats on reaching the 5000 mark! And thanks for sharing the excitement with us all! Awesome giveaway. Thanks for the opportunity. Glad to be a part of this group. Just started the series. Would love to win. Thank you for this opportunity to win this new book! I will buy it regardless of weather or not I win it! Thank you for the opportunity! Would LOVE LOVE LOVE to win! Well, I don’t have twitter so hopefully I have a good shot at winning with my other entries!! I don’t use twitter either, so I’ll take what I can get. It’s a great opportunity. Good luck everyone! This is such an awesome idea. Thank you! This would help start the new year off right…JAMMF !!! Thank you for the chance! OoOOOo I hope I win! Would be a lovely surprise! I’m so freaking excited about this book! Love DG!!! I can hardly contain myself! I want the book out now! These daily teasers are killing me! I have been a fan since the very beginning! All of my paperbacks look like they are a hundred years old they are my go to, take a break from reality books. A friend of mine recommended that I read Outlander. I haven’t been able to put the books down since! I’m now nearing the end of An Echo in the Bone and it’s making me sad to think of how long I’ll have to wait to continue on with the storyline! Congratulations on reaching 5,000 fans! I never win anything, but hey, it can’t hurt trying anyway. I’m reading book 7 now. I really need to win so I don’t have to wait for book 8 to hit the libraries! Lovely givaway. Looking so forward to this one. I’ve shared your contest on Facebook via my phone and have no idea what the url is. How do I get credit for the share? just send the URL of your FB page or your FB username, so we can verify. The giveaway of a lifetime! Love you guys, almost as much as Herself and Jamie! Congratulations on 5,000 likes! Thanks for doing a give away. Crossing my fingers!! Good Luck everyone! Congrats on the milestone! I cannot wait to read this book. I would LOVE to get this I can’t wait for it to come out!!!! Would love a copy of MOBY! Lovely give-away! Soooo looking forward to Mohby! Thanks for opening to Internationals too! Very excited!!! Merry Christmas Outlanders! Thanks for the great read(s) Diana! Thanks this would be awesome! Congratulations on reaching the milestone of 5K likes. What a great way to celebrate! I’ve put this on my Christmas wish list anyway – how did you know?! Congrats on the milestone! I would love to win this!!!! Can’t wait! No one writes like DG. Oh how I love these books. Congrats on your 5,000 likes!! Just steamed re-reading the series again!!!! Love these books – can’t wait for MOBY! I would love to win this. I own the first 3 books in the series, this would be a wonderful addition to my well-read collection. Thanks. Congratulations for this huge mile stone in such a short time! Anxious to own Moby and rolling pennies for a site visit. Would very much love to win and would be most appreciative and grateful! Thank You and Merry Christmas. Saor Alba.. I know what I’m wishing for from Santa! This will make a great addition to my bookshelf!! Winning this would be a great way to start my summer! What a great contest! Can’t wait to read MOBY! LOVE Diana. Started reading her books 15 years ago. What a relationship!! This is a great series and I would love to win Written In My Own Heart’s Blood! Diana is an extraordinary writer. I’m so glad I discovered her many years ago. Not that I wouldn’t love, love, love to win this one!!! Please and thank you! 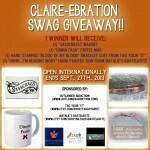 Great Giveaway!!! So excited for this book! 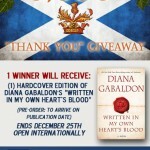 *fingers crossed* What a great giveaway! I am anxiously waiting for the book to be released…I have waited this long, what’s a few more months? Thank you for this great opportunity! I love this series! This would be a lovely item to win! Thank you for the opportunity! Nice giveaway! Would love to get the book! Would absolutely love this! Huge fan, read the books numerous times! What a wonderful Christmas gift! Would love to have so that my sister’s and I could all read it. I would LOVE to win this!! A huge fan of this series. I am so excited to read this book!!! Thank you! How fun!!! Congrats to whomever is chosen as the winner!!!!! Congratulations on 5,000 likes! And thanks for the giveaway! I’m crazy about these books! Everytime that a new one comes out, I read them all again… I never have enough of Jamie and Claire. Would be nice to read the book while I am visiting Scotland in Aug.
Any chance to get my little fingers on Diana’s new release, I will do it. To win it would be fabulous!!! Gonna get it anyways, might as well be free! Cant wait! Thanks for the chance to win! I can’t wait to own this book! Thanks for the great giveaway! June can’t come soon enough!!! Congratulations on 5000 likes! That’s amazing! Great contest! I can’t wait for June and to be reunited with the characters once again! Thank you for the contest! So glad it’s for us non-U.S. residents too!!! I would love to win !!!!!!!!!!!!!! This would be an awesome addition to my Outlander shelf! Great!!!! thank you!!! saludos from Argentina! I would love to win this book!!! A friend of mine would love to have it…and I’d love to give it to her. This would be so awesome! This would be the best gift ever! 2014 is going to be a great year! Moby and the starz series! Can never have too much outlander. YEA!!!! Can’t wait for the book!! Can’t wait for this book to be launched! Love this series, the author, the characters, the fans. Wow, just wow. Wistfully wondering when I will win! I would love to win a copy of MOBY! Thanks for the offering this wonderful drawing to all the Outlander Fans! WOW! Thank you for the chance! Can’t wait to read this. OMG! I would love to win MOBY!!! Congratullations on your 5,000 “Likes”; you are most generous in offering this giveaway. Thank you. Would love a hardcopy of MOBY! So excited for this release! It will make summer 2014 awesome! I would love to win – my favorite author ever! Already ordered the kindle copy, but a hardback copy would not be amiss Thanks!! I would love to win this! Congrats on your milestone! I can barely wait to get this book in my hands and then ” punch out” and read til I drop. Been waiting for a long time for this one! I am Outlander Obsessed! I Really really really want to win this! I can’t wait to read it! Now I need to re-read all the other books just to be ”in context” when MOBY gets here! Looking for to reading this book! I would LOVE to win, otherwise I have to wait for the paperback. What a wonderful opportunity, thankyou! This would make my year. Thank you got this opportunity!! What a wonderful contest!!! Thank you! What a nice thing to do!! 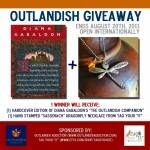 What a great giveaway I would love to win this book from my favorite series!! Can’t wait! Going to see her this summer in LA! I would love to win this book!! Just can’t wait for this book! Thanks for the opportunity to win it! Fingers, arms, legs, eyes, EVERYTHING is crossed! How wonderful that Outlander Addiction has grown so fast. You’re doing a great job! Keep up the good work in 2014! Cannot wait to read MOBY! Can’t wait to read MOBY!!!!! Great chance… Merry Christmas to you all! Amazing give away! Thanks for the opportunity! What a great giveaway! Excited for MOBY! This would be the best Christmas gift!! Can’t wait for MOBY to come out!! Congrats! And best prize ever! I can’t wait to read this book and hope I win! Thanks! Love your site – thanks for all the great giveaways. Merry Christmas!